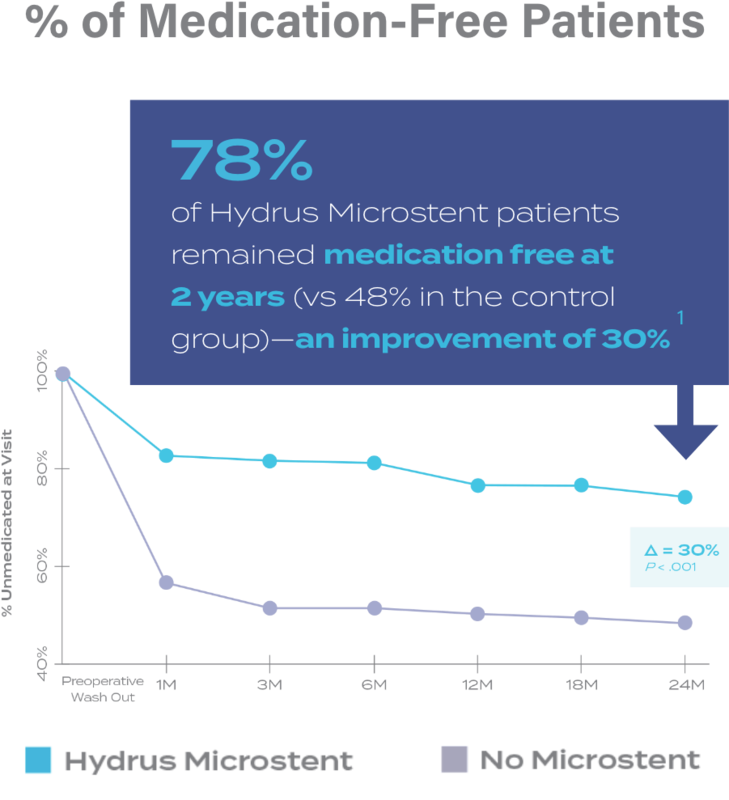 Compared to results with cataract surgery alone, the Hydrus Microstent treatment effect showed increased benefits from year 1 to year 2. 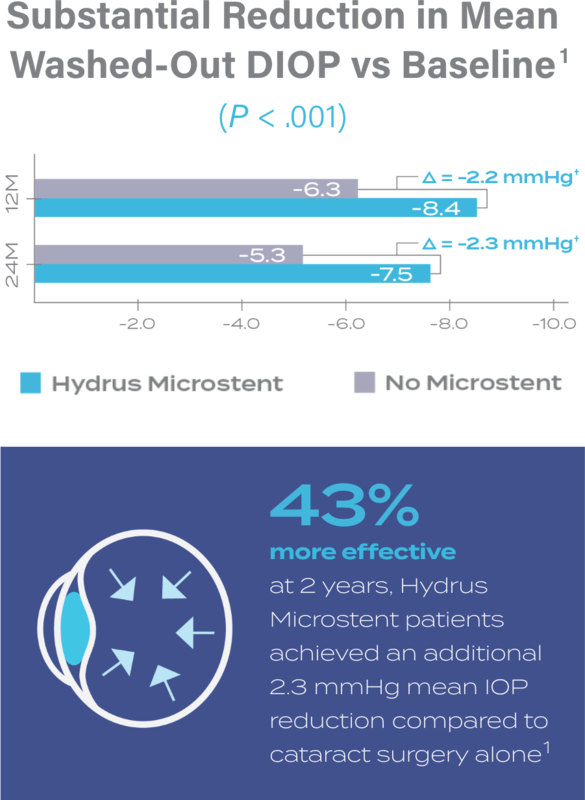 Read recent publications and abstracts to learn more about the Hydrus Microstent. References: 1. Samuelson TW, Chang DF, Marquis R, et al; HORIZON Investigators. A Schlemm canal microstent for intraocular pressure reduction in primary open-angle glaucoma and cataract: The HORIZON Study. Ophthalmology. 2019;126:29-37. 2. Vold S, Ahmed II, Craven ER, et al; CyPass Study Group. Two-Year COMPASS Trial Results: Supraciliary Microstenting with Phacoemulsification in Patients with Open-Angle Glaucoma and Cataracts. Ophthalmology. 2016;123(10):2103·21 12. 3. US Food and Drug Administration. Summary of Safety and Effectiveness Data (SSED): Glaukos iStent® Trabecular Micro-Bypass Stent. US Food and Drug Administration website. hnps://www.accessdata. fda.gov/cdrh_docs/pdf8/P080030B.pdf. Published June 25, 2012. 4. US Food and Drug Administration. Summary of Safety and Effectiveness Data (SSED): iStent inject Trabecular Micro-Bypass System. US Food and Drug Administration website. https://www.accessdata.fda.gov/cdrh_docs/pdf17/P1 70043b.pdf. Published June 21 , 2018. 5. US Food and Drug Administration. 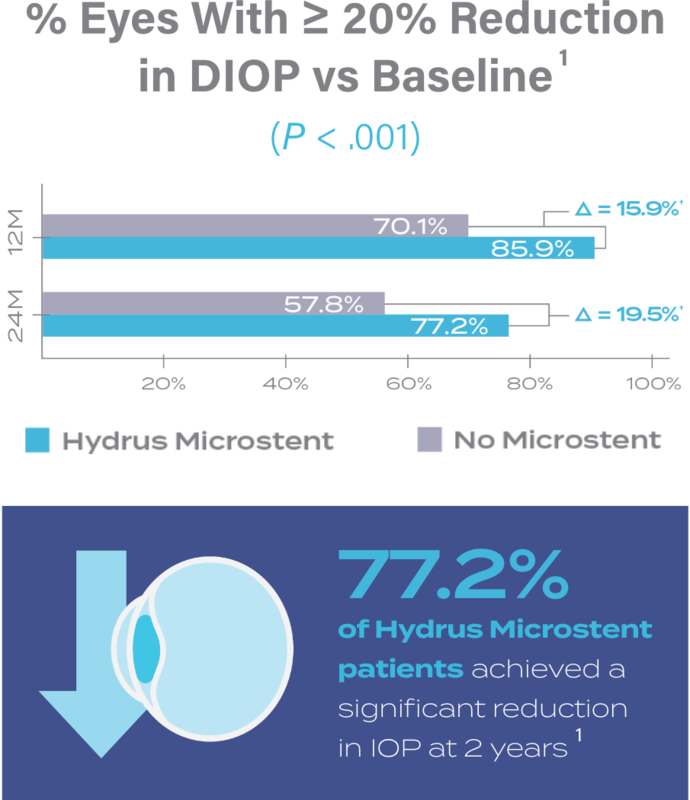 Summary of Safety and Effectiveness Data (SSED): Hydrus Microstent. US Food and Drug Administration website. https://www.accessdata.fda.gov/cdrh_docs/pdf17/P170034B.pdf. Published August 10, 2018. 6. Al-Mugheiry TS, Cate H, Clark A, Broadway DC. Microinvasive Glaucoma Stent (MIGS) Surgery With Concomitant Phakoemulsification Cataract Extraction: Outcomes and the Learning Curve. J Glaucoma. 2017;26(7):646-651. *Comparison based on results from individual pivotal trials and not head to head comparative studies. †Calculation difference due to rounding.